The reported death of actor and comic Robin Williams by suicide saddened me. To all who watched him from afar, we were entertained into believing he appreciated the same joy he unselfishly bestowed on others. But that’s the battle with depression: we don’t feel others will either understand or accept us despite the beast doing war within, so we hide behind a smile or an “I’m fine” when asked. It saddens me to hear and read of the judgment cast on Mr. Williams and others who chose suicide as a means to end their pain. 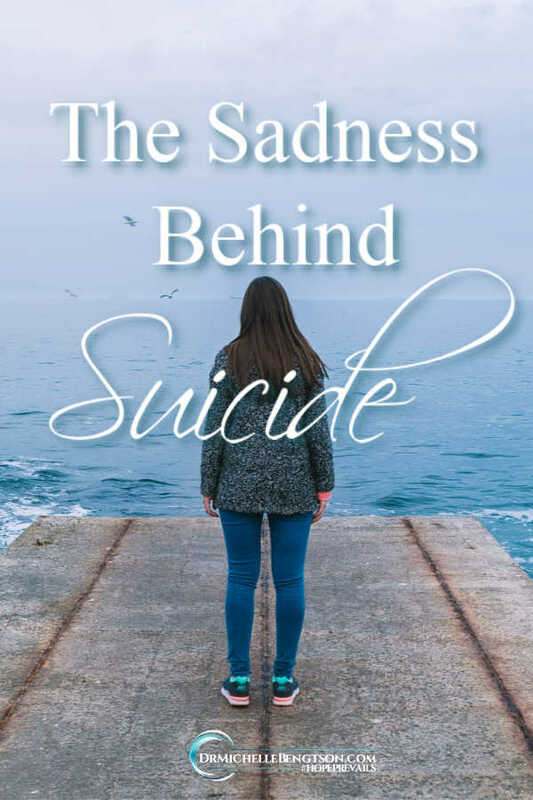 Suicide is rarely about a desire to die, but rather, a deep desire to make the pain end. I am sad that he lost his hope and felt there was no other way to escape. I have gone through periods of despair when I wondered when things would turn around. But I also strongly believe that as long as God is still on His throne, there is hope! It’s not over until God says it’s over: “The thief comes only to steal and kill and destroy; I have come that they may have life, and have it to the full” (John 10:10). I want that full life, don’t you? 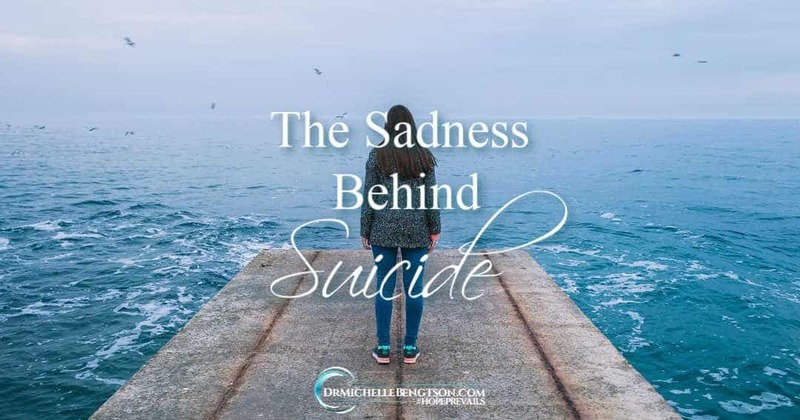 I have heard it said “suicide is a permanent solution to a temporary problem.” That bothers me because in the span of eternity, yes, depression is a temporary problem, but for those in the throes of depression, it feels like a never-ending tragedy. The reality is, however, that with suicide, one person’s pain ends forever, but then the pain of surviving friends and family continues. It’s so important that we remain in God’s word, and continually be transforming and renewing our minds with the word of God. While the facts may indicate that you are suffering with depression, God’s truth says that you are worthy, you are valued, you have been redeemed, God is for you, and by His stripes you are healed. Talk to your doctor as soon as possible. Your medical professional’s passion is to help you achieve complete health—physically and mentally. Your doctor can help determine what treatment might be most beneficial. Talk to a trained professional—while so many mental health disorders can make one feel embarrassed and ashamed, including depression, the shame tends to come from feeling we must hide and not reveal our true selves. Secrets only hold power over us until they are told. 1 John 1:7 indicates that when we walk in the light, not hiding our pain or our true selves, just as Jesus is in the light, then we have fellowship with others and a chance for comfort and healing. Talk with a counselor, psychologist, or church staff about your struggles—doing so can provide guidance and help you not feel so alone. Search the scriptures for verses and God’s promises that apply to your current situation. Write them down and commit them to memory. The Bible tells us that the joy of the Lord is our strength (Nehemiah 8:10). It doesn’t tell us that we have to depend on our own strength. Rather it encourages us to rely on the Lord for our strength. Pray. No one understands how you are made or what you are going through like the very one who created you. He tells us over and over in His word to give him our burdens. He wants to help. Consider attending a support group or getting an accountability partner. In the midst of depression, it is difficult to view things objectively. Having a trusted individual or group to hold us accountable and help us see things from another perspective is extremely helpful. If you feel you have no other option, call a suicide hotline: 1-800-SUICIDE (784-2433). Their trained professionals want to help. When you are the one suffering through depression, it may not feel like it, but the truth is, there is always hope. It is temporary to someone who does not know Jesus and finds him or herself in a worse place of torment. I think Christians suffering is in part to the nearness of His return and perhaps a high level of demonic oppression. We definitely want to see souls enter heaven, but if even a pastor is suicidal, we do need to realize that we can do nothing in our own strength but His. Can any of us really beat anything without HIm? I’d say no. I think there are many factors involved, as I outlined in my book. But what is clear is that when someone gets to the point of considering suicide, they are desperate and they want the pain to end. What they need is love and compassion, not judgment and shame. I pray more will come to realize that. As do I, only God knows hearts, He judges righteously. Michelle, you are such a great voice of hope to so many! Thank you for sharing these helps and encouraging people to ask for help. There is no shame in needing help and our society needs to realize that. May God bless you and continue to bless and use your very important work to help others. I’m your neighbor at #TuneInThursday this week. I do hope it helps Gayl. I don’t want anyone to go through that kind of pain alone. I love when linkups link us up 🙂 You’ve been tweeted, pinned and now commented on! Your voice for the hurting is beautiful. As someone whose life has been inundated with issues of mental health in family members and struggling with my own issues, I so appreciate your words. God is so much bigger than anything else we can ever face. 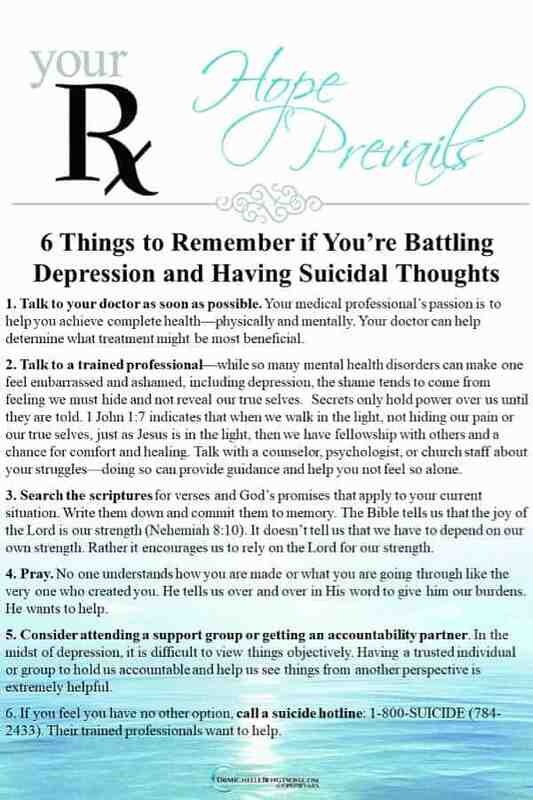 Praying God uses this post to protect many from following through with their thoughts of suicide. Thank you Sherry. I pray it encourages and gives others hope…His help, hope, and healing! Love you big! We need your voice in this world of depression and mental illness. You are a blessing! Thank you Mary. I pray it helps someone. I don’t want anyone to feel alone. Thank you for this, Michele. Thank you for being a much needed voice on the topic of suicide. Glad you shared at Grace & Truth Christian Link-Up. I can’t rave enough about the suicide prevention hotline. They are great source of help whether you are calling for yourself or someone else. No need to wait until desperate just go ahead and call them. I’ve always been bothered about the axiom that suicide is a permanent solution to a temporary problem–that’s something that a rational, mentally healthy person can understand. Not something that someone seeped in pain can understand. Thank you for giving other alternatives!